It’s October and the “pizza witch” is hard at work crafting spell-binding pizzas. Megan Jones-Holt got her title as the pizza witch when a customer took a bite of one of her pizzas and proclaimed the flavor combination to be magical. It’s all the more amazing considering that Jones-Holt never made a pizza until two and a half years ago when she took over Market Pizza at the Stockton Farmers Market in Stockton, N.J.
She and husband Matt Holt bought the pizza stand from local gourmet restaurateur and chef Jamie Hollender, who taught her how to make pizzas. But like any good chef, she eventually began to experiment with her own flavor combinations. The result is that her weekly specials, where she puts together locally raised and grown ingredients on her thin pizza crusts, come close to outselling her regular offerings. “There is a group of foodies who check my Facebook page each week to see what I am making,” she said, and some come every week to taste for themselves. Those creations are unlike any others you will find in the area because they come straight from her imagination. Recent weeks included the Roasted Pumpkin with garlic, black beans, ham, Jersey Fresh tomatoes, jalapeños and a sherry vinegar reduction. Also the “We’re Nuts” pizza with local hazelnuts and ricotta, mozzarella, parmesan and a honey drizzle. The pizza that earned the “magical” designation was Jones-Holt’s mushroom pie with white truffle oil. She uses mushrooms purchased at the market, along with onions cooked in balsamic vinegar, asiago cheese and mozzarella. It is one of her top sellers, along with her Margherita pizza. She also offers a “Breakfast Any Time” pie with an egg garlic chive potatoes, Applewood smoked bacon, mozzarella, parmesan and rosemary. 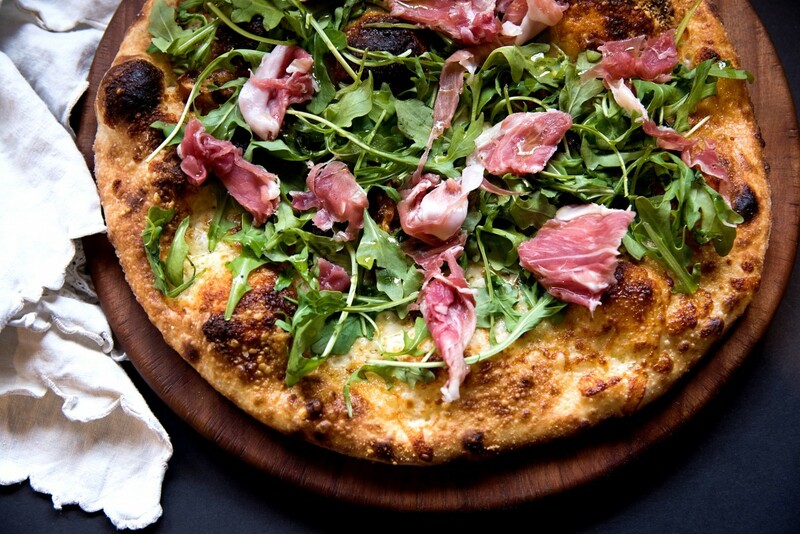 A Black Forest pizza has fontina cheese, mozzarella, fire-roasted tomatoes, arugula and prosciutto. She offers traditional pepperoni and sausage pizzas and a cheese-free vegan pizza. For those avoiding gluten, she found gluten-free dough she likes that can be used to make any of her pizzas. Because each pie is made to order, she said people also can craft their own combinations. Jones-Holt grew up in a cooking family but her career path took her in other directions. After she and her husband sold their event rental company, the opportunity to buy the pizza stand came along. “I thought, that sounds like fun,” she said, and the transition was pretty much seamless. In addition to serving her customers at the market she makes par-baked pizzas for six other markets, and takes orders from her customers for pizzas they can take home and finish baking. 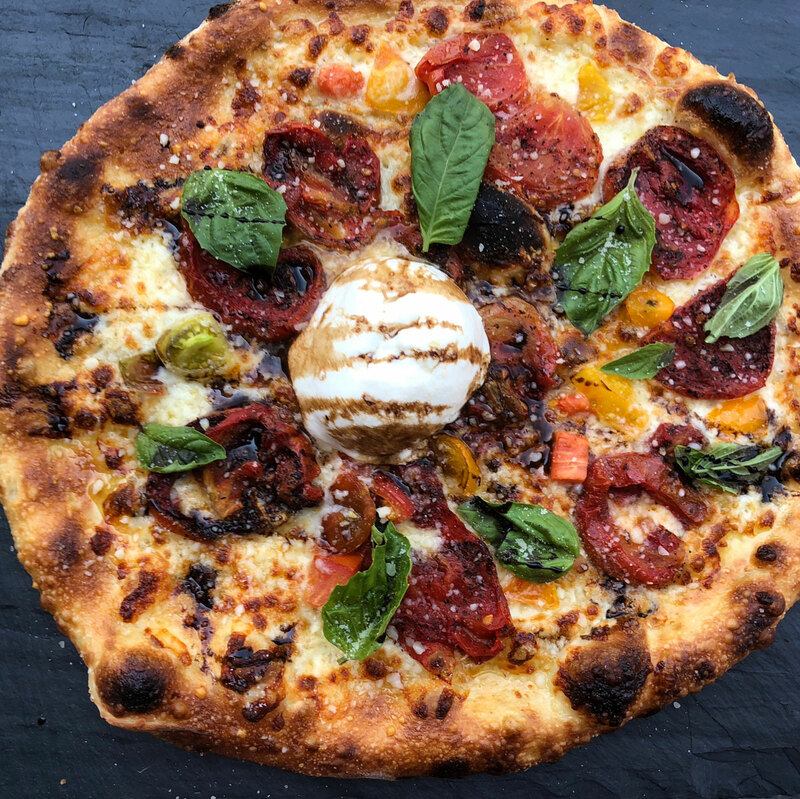 Market Pizza’s customers have responded positively, nominating it, then voting for it in a variety of area “best of” contests. They stop by regularly to sit on her six stools and see what bewitching combinations she is offering each week.